The Sinner (10/9c, USA): The second season of the gripping psychological mystery anthology reaches its end with plenty of questions remaining. Who killed Marin (Hannah Gross), last seen lying in a pool of blood outside the motel where she was hiding with her biological son, Julian (Elisha Henig)? Where is the boy? And what’s the real story behind his origins at the Mosswood cult? 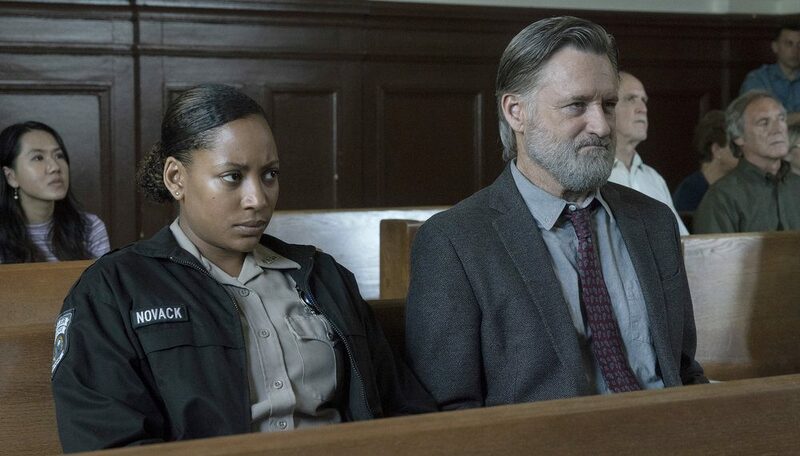 More revelations, some deeply personal, are in store for Harry Ambrose (Bill Pullman) and detective Heather Novack (Natalie Paul), as all is revealed — although maybe not entirely resolved. The actress talks about the conflict between Heather & Ambrose on the USA crime drama. America’s Got Talent (8/7c, NBC): Could a dance group (Zurcaroh), a magician (Shin Lim) or a comedian (Vicki Barbolak, Samuel J. Comroe) take home the top prize? Or will it go to a singer, or, following recent tradition, a talented youth (14-year-old Courtney Hadwin)? The results are in and will be announced in the grand finale of the popular summer talent contest? Expect guest performers and other surprises before the confetti showers the winner of $1 million and a gig in Las Vegas. The Elongated Man may have some competition in the flexibility department! I Feel Bad (10/9c, NBC): Getting a jump on the upcoming network Premiere Week, this frantic new sitcom from Aseem Batra finds a fresh face, and welcome diversity, in star Sararu Blue as harried working mom Emet. But the “I’m turning into my mother” gags feel even more tired than poor Emet herself. It’s even worse at her video-game workplace, where she’s the sole woman on a team of annoying man-boys, who give her terrible “man-splaining” advice. At least at home Emet has the reliably likable Paul Adelstein (Girlfriends’ Guide to Divorce, Private Practice) as an equally overwhelmed husband who tries, though often fails, to cut her some slack. NBC previews the series with back-to-back episodes, and the second episode — in which Emet invades a vacationing neighbor’s home for some “me” time — made me feel bad for witnessing Emet’s over-the-top self-absorption. Inside Wednesday TV: In anticipation of next week’s Season 22 premiere, Comedy Central’s South Park launches an eight-day marathon (starting at 9 am/8c) featuring all 273 episodes of the outrageous animated hit. (The show will make room for nightly editions of The Daily Show with Trevor Noah and The Office repeats, as well as Tosh.0 and The Jim Jefferies Show on Tuesday. )… PBS goes inside The Amazing Human Body (8/7c, check local listings at pbs.org) with a three-part series, airing all in one night, using state-of-the-art graphics to illustrate the mechanics and biological processes of the body. Episodes are titled “Grow,” “Survive” and “Learn,” which pretty much says it all… Having proved there’s life after Mike and Rachel, USA’s Suits (9/8c) airs its fall finale, with Donna (Sarah Rafferty) once again stepping up to do what’s best for the firm… In his eighth appearance on the late-night talk show, Kevin Hart steps up to co-host NBC’s The Tonight Show with Jimmy Fallon (11:35/10:35c), with guests including animal expert Robert Irwin and his exotic friends.